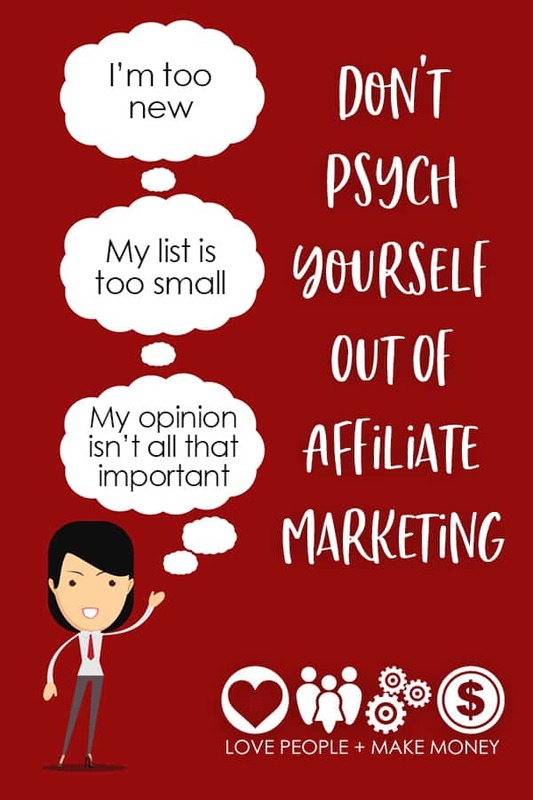 When I was new to Affiliate Marketing, I totally psyched myself out of it. I signed up for a few affiliate programs, I don't remember which, and I tried to promote them here and there and not surprisingly, I didn't do well. (Meaning I didn't make any sales.) I chalked it up to the idea that I was ‘too small' to be an affiliate marketer. It was true. I had a small website with small traffic, a small circle of influence and a small amount of patience ;) Oh – and quite a bit of small thinking! When I entered into my first real partnership, she (Alice Seba) asked if I'd like to split affiliate commissions on the services and products we recommended within the membership. I said ‘Nah'. I thought it wouldn't be enough money to be worth the trouble. I don't know how many times I had similar faulty thoughts about it – but I do know it was a full year later that I finally woke up and realized what I was missing out on. The person (Lynn Terry) who first referred me to Aweber continues to earn commissions on my quarterly payments today. That's about $70 per year which (considering 15 years now) means she's up to about $1000. Can you imagine how many people she's referred over the years? I'd love to know what her Aweber checks look like. Recommending tools that people will use over the long term is a fantastic residual affiliate opportunity, IF the residual commissions are offered. Things like Email Management and Hosting are ‘must have' tools for all marketers. Speaking of Hosting, most Hosting company affiliate programs are not residual :( They pay out a lump sum and that's that. When we planned out the Mom Webs Hosting Affiliate Program we knew we wanted to break that mold and offer a residual program. We pay affiliates a 20% commission, residual for the life of the client. You refer a new hosting customer who signed up for the $10/month multi-domain hosting plan. You earn $2 for their first month payment. Small potatoes compared to the $50-$65 that other programs will pay out to you, right? Ok – well, let's look at the long term. That customer earns you $24 for the year – and another $24 every year after. (And most hosting clients DO stay for the long term.) If you make my early mistake and only think about the short term, you'll choose the big bucks fast. But if you're smart like I am today, you'll choose the residual option and be earning year after year. This is when a recurring affiliate commission program ROCKS. If you reach people who have multiple websites or those who are ready to invest more to safe guard their web properties – you'd be leaving money on the table to refer them to one of the ‘one payment only' programs. I sure hope so! I know I am. I'm going to shake off the ‘oh but so many other people are promoting it‘ small thinking that I've been guilty of and just go for it. Ask around your niche and find out who your contemporaries are earning from. Be creative and be purposeful! Affiliate marketing in your sidebar will never work like you hope, you have to intentionally promote the tools and resources that you believe your people need. If you'll go the extra mile, you might surprise yourself! If you've dismissed affiliate marketing in the past, will you give it another go? My affiliate program rocks – all of my Super Affiliates tell me so. I have small cost products, mid cost products and high end products. I have a low cost membership and a high cost membership. I pay a 50% commission on my info products and memberships. I pay a 30% commission on my group coaching programs. Oh, and I pay forever. I honor a lifetime database connection for your new referrals, so as long as they spend money with me, you're earning commissions. Oh, I can so relate to this! I have a tiny little mailing list, and each time I think to send out a mailing I talk myself out of it. All self-defeating talk that has NO relevance! And I know it has no relevance because every time I do get up the gumption to mail my list, I make sales! I think the lesson here is “Just do it,” so I’m going to go tell my list about an awesome new product I found the other day that I know they’ll love. Thanks for the push, Kelly! Kelly, I often think the same thing! I am amazed at how good my income is from Freshbooks, for instance. With them you don’t get paid forever but you get paid for the first year and I consistently make a nice payment every six months, and it always surprises me. All my affiliate income surprises me. I don’t really work that hard at it. It sure makes me happy. How little work is it to send out a quick email to your list? It’s more than worth it! I’ve been down the same road as you over and over again. However, my downfall every time was that I was in effect taking my eye off our main business to try my hand at affiliate marketing. I love web dev and writing but our main business has done well over the years and needed my constant guidance. Now however it’s streamlined, so I can focus on starting a business that will generate residual income (or what i call my retirement fund). I’ve been at it 3 months now and am yeat to add in any affiliate links to the site but the traffiics doubled in that period. It’s hard work but every time I get a new reader, visitor or analytics says I’m getting visitors from a new Country I feel like I’ve achieved something. It’s not all about the money after all. I do think SMALL and have really been working hard towards a THINKING BIG! One point hit home here: MY LIST is completely different than ANY IMer List. Hmmm, that never quite occurred to me before. MY List is full of retirees, seeking retirement solutions, ideas and more. Even though *I* have seen dozens of the same offer, enough to make me a crazeee person… my readers have NOT. You are spot on, as usual, Kelly. And I love those lifetime database referrals with amember! I’ve got to focus more on growing my relationship with my list, and offering them products I think will be helpful. Thanks for the reminder!